Ralph McLean – Project Director - South Africa War Graves Project – 39, lives in Canada, currently in Edmonton, Alberta...but works in Oil and Gas in Northern Alberta. By trade a Health and Safety Professional, formerly in IT and a military and police antique dealer. First started helping out the Maple Leaf Legacy Project and as a result of nearly three years of globe trotting came home with a collection of 60 - 80,000 war graves and names on memorials photographed for all projects to date. Photo taken in Medjez-El-Bab War Cemetery, Tunisia in front of the war grave of a man from Ralph's home town. 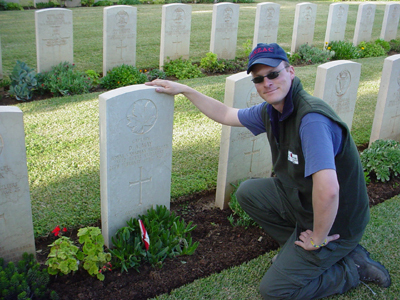 Steve Douglas – Project Director - Maple Leaf Legacy Project – “The man who started it all”. Steve is the project director of our sister project for Canada. He is a native of Kitchener, Ontario and, most recently, a seven year resident of London, Ontario, is currently based in Ieper (Ypres) Belgium because of the access to the majority of war cemeteries of the western front. He was the one who dreamed the impossible dream, thus giving us the courage to take the next step. Steve runs a book store in Ieper in between replying to project emails and photographing cemeteries. Matt Smith – Project Director – Australian War Graves Photographic Archive – Matt is the project director of our sister project for Australia. 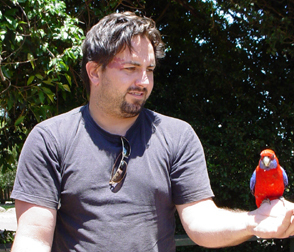 Matt was kind enough to put up the project director for over a week at his home in Australia in Tanah Merah (outside of Brisbane), Queensland, Australia. He even helped build a bed in the back of the project’s director backpacker van to make his stay in Australia that much cheaper. Matt besides being a project director is a high school teacher is married with three children. Ricky is one of our more enthusiatic volunteers. He was is the National Coordinator for South Africa (stepped down Nov. 1, 2007) where he has done some press coverage for us and taken many photos. He is a former police officer and he is married with a baby girl. 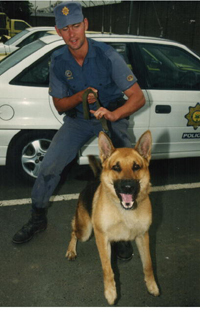 The below picture is of Ricky and Champ (his beloved police dog...now passed away). The both of them used to regularly make trips out to the cems where they battled lions, snakes and the lot to do project work. Rupert Drake – former National Coordinator for United Kingdom – “Roop” is a volunteer to the 5 projects but no less enthusiastic. He lives in Lincolnshire, United Kingdom. In the time he joined us a volunteer to the time he became National Coordinator for the UK was less than 2 weeks (since stepped down to work on contract work in Tanzania). He has shown a keen interest in the project and takes a wonderful picture. 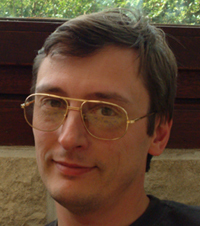 Jean-Michel van Elslande – Belgium National Coordinator – Jean-Michel started to help the project via a chance internet posting. 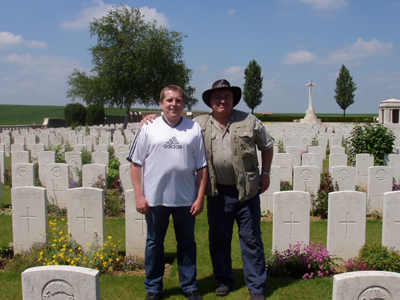 Since then he has photographed many of the graves in Belgium and has started to organize the volunteers there. He is 39 years old and maried, and engineer data processing specialist, member of the Ploegsteert Memorial Commettee for remembrance, member of the Historical Commettee of Comines-Warneton and Member of the 'Source Généalogique et Historique des Provinces du Nord' a historical group in France. Gary and Carina Nelson - USA - Gary is a Staff Sergeant in the Washington DC Air National Guard. He has embraced the ideals of the five war graves photography projects and has traveled to France and Belgium to take photos. A self-taught historian who has web published articles on marching within historically significant areas such as Operation Market-Garden. Carina is a native of Stockholm, Sweden. people-person she has always taken a keen interest in the living cultures of the countries visited. Carina started her working career as a teacher and, later, she ventured a new arena as an operations manager overseeing the travel programs for adventurous Americans traveling to remote parts of the world. Currently she is a certified REALTOR in Maryland. Kevin Johnstone - United Kingdom - age 40 married with 2 kids. Interested in The Great War and the part played in it by the Pals Battalions- especially 11 Border Regiment -the Lonsdale Pals. Volunteer for the British War Memorial Project and Carlisle United FC fan. Norman Smith - United Kingdom - Norman first became interested in war graves when he visited Durnbach War Cemetery in Southern Germany (Bavaria) with his wife to visit her father’s resting place. At the time he asked for anyone who had relatives graves there to let him know if they wanted any photographs. A number of people approached him and he carried out their request. Norman is retired and ex RAF and has found the task very rewarding even though the photographs covered sad times. Photography is his hobby and he was able to photograph some graves in difficult situations. Chris Collier - United Kingdom - 49, single, from Bedfordshire, England. Served with the British Army from 1977 to 1983. Works as a Learning & Development Manager. Other interests, sailing, rugby & military history. British War Memorial Project Coordinator for Hertfordshire & Bedfordshire in England. Howard Wootton - United Kingdom - lives in the city of Salisbury surrounded by the countryside of Wiltshire, in England. He married his partner, Lorraine in April this year (2004). Works in the Gas Transportation business as a Emergency Service Engineer. Interested in the Normandy Landings of WW2 & has visited France on many occasions, with family to tour Normandy. Became interested in the projects when he came across the British project & volunteered to photograph South Wiltshire, in doing so has completed some for the Australians as well as for this project. Interests include photography, playing golf, family research & following Chelsea Football Club. 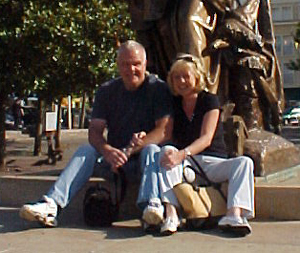 Peter Bennett (on right in photo) – United Kingdom - Born 1947, lives in Dewsbury, West Yorkshire, married to Inara since 1972, two Daughters, one Granddaughter, two Grandsons. 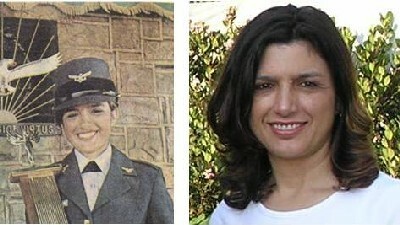 Retired in 2007 after 45 years in retail. In 1997 he discovered the War Grave of his Grandfather who was killed on the Somme in July 1916. Since then, in addition to the Western Front where he is now a regular visitor, he and Inara have visited Gallipoli, Normandy and War Cemeteries in Singapore & Australia. Markus and Gail Röthlin - Switzerland - Markus is Swiss and Gail a South African. Gail became aware of the project while researching her South African family history. They have two sons, aged 21 and 17 and the epitaphs on many of the War Graves are a reminder of how privileged we are to enjoy watching our young men and women grow up. Danie van den Berg - living in Brackenfell , a suburb of Cape Town , in the Western Cape Province of South Africa. He is an accountant with a logistical firm , doing international clearing and forwarding for a variety of clients, from chemicals , yacht sails to components for the motor racing enthusiasts. Due to his involvement with the military for more than 20 years , as an infantry soldier to the rank of Major , he became interested in military history. At present he is writing 3 books on this subject . Due to the frustration when not finding a fellow soldier's grave , while doing research, he became involved as he believes we must record and maintain their graves , something that is neglected at present , as they sacrificed their lives to ensure a better world today. His wife, Emmerentia, accompanies him on this project , she is his extra pair of eyes and ears and has become quite enthusiastic about the project as well. Anne Lehmkuhl - started researching her family history in 1984, in South Africa and Europe. In 1997, she started a professional research service, and since then has worked for clients in South Africa, Australia, New Zealand, USA, Mexico, Canada, Germany, Austria, The Netherlands, Namibia, and the UK. She has published two e-books on South African genealogy, and publish a monthly South African genealogical and heritage newsletter. She is a long-standing member of the Genealogical Society of South Africa, and editor of one of their branch newsletters. research. She feels that volunteering with the SAWGP is special and an honour, as it helps to preserve our military history and honours those who went before, so that their names and sacrifices are not forgotten. Anne is currently helping us out with estate files. and if the deceased had children, one or more generations forward. if the deceased passed away outside South Africa. professional researcher. The Archive offices in South Africa do not provide such a service due to staff and funding shortages. We live in Witbank, Mpumalanga, South Africa. I grew up on a farm in the Middelburg (Mpumalanga) district. 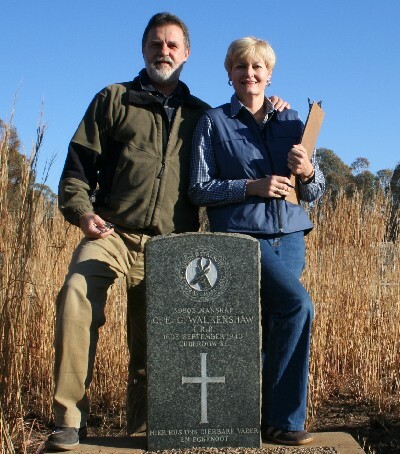 The interest in family history and old graves was sparked by my grandfather, who encouraged me from a young age, to go in search of the burial sites, of deceased family members, who had died during the Anglo Boer war and in concentration camps. 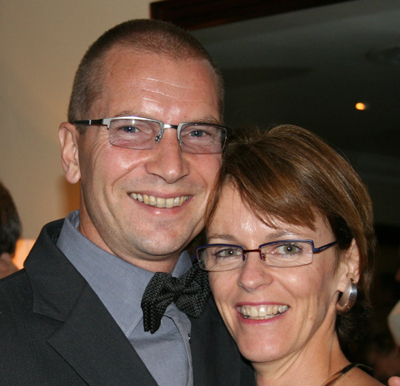 Luana grew up in Rhodesia, and we were married in Salisbury in 1975. She has always been interested in history and has accompanied me on all my trips to cemeteries and farm grave yards. Luana helps me with locating the cemeteries and the graves, making GPS recordings of the sites and watches my back while I take the photographs. I have been a volunteer for the eGSSA cemetery recording project for a number of years, concentrating mainly on farm cemeteries in the Mpumalanga area. Gail Röthlin of Switzerland, introduced me to the SAWG project and I now include military graves in my searches. I have a keen interest in genealogy and old manuscripts, and have researched all branches of my own family. My other interests include bonsais, military firearms and custom made knives. Our trips into the countryside are always very rewarding and we hope that our contributions to the project are useful and that we are able to one day visit the military cemeteries in Europe & North Africa. YOU - send us your pictures and bios!